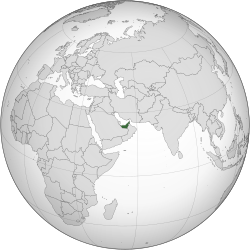 The United Arab Emirates or the UAE is a country in the Middle East. It is made up of seven emirates located in the north-eastern part of the Arabian Peninsula, on the south side of the Persian Gulf. People from this country are called Emiratis or Emirians. Emirians used to be called Trucial Coasters or just Trucials before independence. Emirians from ancient history are called Maganites. It borders Saudi Arabia to the south, Oman to the east, and Qatar to the west. The capital city of the UAE is Abu Dhabi, and the biggest city is Dubai. These cities have become global cities and are often visited by tourists. They have many skyscrapers and one of them, the Burj Khalifa, is the world's tallest structure. As a member of the Arab League, the country's official language is Arabic. The country has some traditions and one of them is eating dates. That is why date palms are often grown in the UAE. ↑ "The World Fact Book". Central Intelligence Agency. ↑ "United Arab Emirates". CIA World Factbook. ↑ 3.0 3.1 3.2 3.3 "United Arab Emirates". International Monetary Fund. ↑ Winder, Bayly (1965). Saudi Arabia in the Nineteenth Century. p. 33. This page was last changed on 26 September 2018, at 22:29.